Vatnajökull,[a] also known as Water Glacier in English, is the largest and most voluminous ice cap in Iceland, and one of the largest in area in Europe. It is the second largest glacier in area after Austfonna on Svalbard in Norway but, nevertheless, larger by volume. It is in the south-east of the island, covering approximately 8% of the country. With an area of 7,900 km², Vatnajökull is the largest ice cap in Europe by volume (about 3,000 km³) and the second-largest (after Austfonna on Nordaustlandet, Svalbard, Norway) in area (not counting the still larger Severny Island ice cap of Novaya Zemlya, Russia, which may be regarded as in the extreme northeast of Europe). On 7 June 2008, it became a part of the Vatnajökull National Park. The average thickness of the ice is 380 m (1,250 ft), with a maximum thickness of 950 m (3,120 ft). Iceland's highest peak, Hvannadalshnúkur (2,109.6 m (6,921 ft)), is in the southern periphery of Vatnajökull, near Skaftafell National Park. An iceberg with Vatnajökull in the background. The icebergs in Jökulsárlón, as well as this one, have broken off Vatnajökull's outlet glaciers. Under the ice cap, as under many of the glaciers of Iceland, there are several volcanoes. Eruptions from these volcanoes have led to the development of large pockets of water beneath the ice, which may burst the weakened ice and cause a jökulhlaup (glacial lake outburst flood). During the last ice age, numerous volcanic eruptions occurred under Vatnajökull, creating many subglacial eruptions. In more modern times, the volcanoes continue to erupt beneath the glaciers, resulting in many documented floods. One jökulhlaup in 1934 caused the release of 15 km3 (3.6 cu mi) of water over the course of several days. The volcanic lake Grímsvötn was the source of a large jökulhlaup in 1996. There was also a considerable but short-lived eruption of the volcano under these lakes at the beginning of November 2004. On 21 May 2011 a volcanic eruption started in Grímsvötn in Vatnajökull National Park at around 7 p.m. The plume reached as up to 17 kilometres (11 mi). The glacier was used as the setting for the opening sequence (set in Siberia) of the 1985 James Bond film A View to a Kill, in which Bond (played for the last time by Roger Moore) eliminated a host of armed villains before escaping in a submarine to Alaska. Several other films, including another in the Bond franchise, have been filmed on or using Jökulsárlón, the terminal lake of the Breiðamerkurjökull outlet from Vatnajökull. Westlife's official music video for their twenty-fifth single top 10 and #2 UK hit in 2009 "What About Now" is the last film of Vatnajökull Glacier before the subsequent volcanic eruption. In November 2011, the glacier was used as a shooting location for the second season of the HBO fantasy TV series Game of Thrones. In 1950, a Douglas DC-4 operated by the private airline Loftleiðir crash-landed on the Vatnajökull glacier. Vatnajökull has around 30 outlet glaciers flowing from the ice cap. The Icelandic term for glacier is "jökull", and so is the term for outlet glacier. 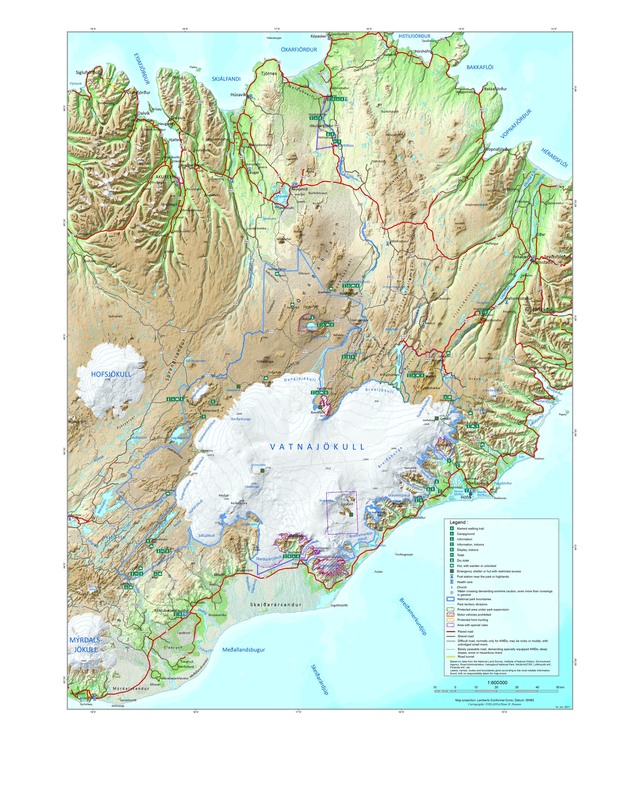 Given below is a list of outlet glaciers flowing from Vatnajökull, sorted by the four administrative territories of Vatnajökull National Park. This is not a complete list. ^ a b c d e f "Hver er stærsti jökull í Evrópu?". Vísindavefurinn (in Icelandic). 5 February 2016. ^ a b c "Skaftafell national park" (PDF). The Environment Agency of Iceland. 2006. ^ "Vatnajokull National Park". Háskóli Íslands. hi.is. Archived from the original on 24 April 2009. Retrieved 9 July 2010. ^ "Hversu hratt mun Vatnajökull bráðna á næstu árum?". Vísindavefurinn (in Icelandic). 24 September 2001. ^ a b Scheffel, Richard L.; Wernet, Susan J., eds. (1980). Natural Wonders of the World. United States of America: Reader's Digest Association, Inc. pp. 394–395. ISBN 0-89577-087-3. ^ "The Gjálp eruption in Vatnajökull". Institute of Earth Sciences, University of Iceland. ^ a b c "Grímsvötn eruption 2011". Insitute of Earth Sciences, University of Iceland. ^ "A View to a Kill (1985) - IMDb" – via www.imdb.com. ^ "Official News (GB) - New Westlife Blog : Mark". Westlife. 2010-04-16. Retrieved 2010-05-16. ^ "Iceland filming location revealed". winter-is-coming.net. 28 October 2011. Retrieved 28 October 2011. ^ "COLLISIONS AND BOMBS!". dc3history.org. 2010-04-12. Archived from the original on 2010-04-28. Retrieved 2010-05-16. ^ "General information map". Vatnajökull National Park. Archived from the original on 10 June 2015. Retrieved 25 October 2012. Wikimedia Commons has media related to Vatnajökull.